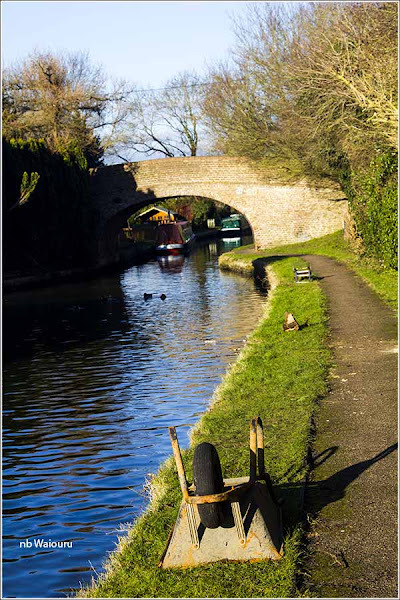 Off to Stoke Hammond Lock… but on foot! We awoke to the heaviest frost of the year and the canal frozen over. Jan managed the get the ice breakers working. A relatively simple task. 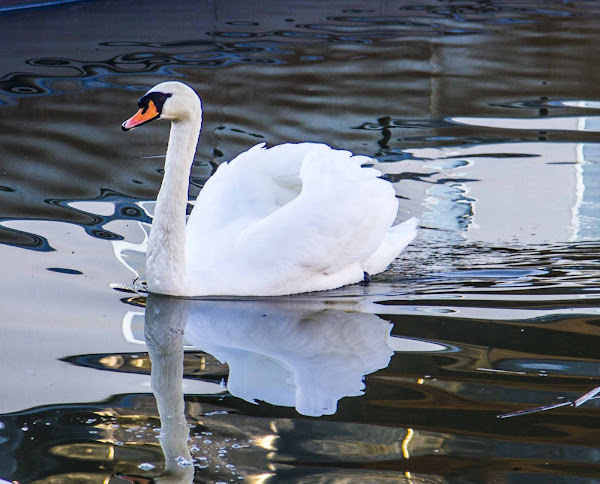 All she had to do is throw a few of MY crackers out the side hatch and the two swans did the rest. She (Jan) is hopefully at the peak of her winter cold and can start on the road to recovery. I suspect she is becoming stir-crazy trapped inside Waiouru. I can report the towpath to our next lock (Stoke Hammond) is in good order. But even if it was muddy, it would have been frozen mud. Something caught my eye just beyond Fenny Stratford Lock. My initial reaction was these lock gates had been installed for a future restoration. Then I realised they were decorative. Further down the towpath there were signs of CM nests. I’m not sure if they have been scared off by my passage or gone scavenging. We will be passing this way so I wanted to check on the price of diesel at Willowbridge Marina. 79.9p/ltr. We haven’t seen it that high in several months. Perhaps the price will rise as we head south. A few phone calls may be on tomorrows ‘to do’ list. Interestingly, they had a sign on the wharf stating boat owners will need to provide proof of insurance before their boat would be lifted out. I’d be more concerned to know the boatyard had insurance and their crane had been tested and certified safe. 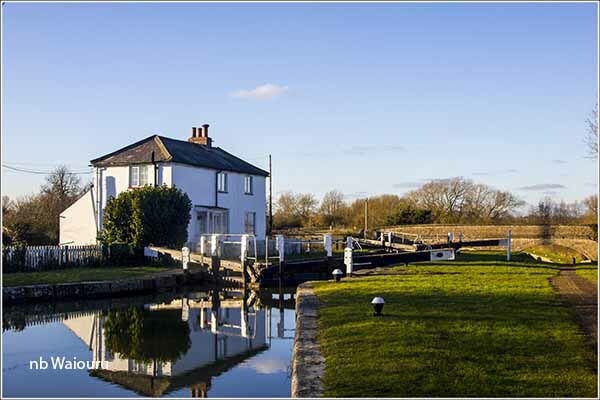 The initial impression of Stoke Hammond Lock was that it might originally have been paired. Two bridge arches with the same span? 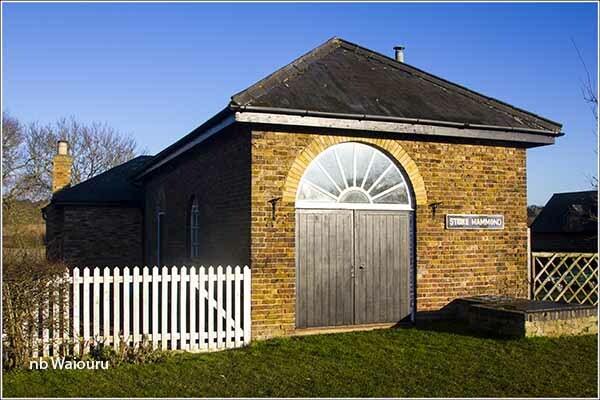 The single lock has a former lock keepers cottage on one side and a pump house on the other. The latter has been converted into a home. This foreigner appears to have ruffled the feathers of one of the locals. Last night’s weather forecast was for rain this afternoon…… But it didn’t happen here! It’s been a beautiful day, albeit cold! Tomorrow I might head back to Lidl. Their weatbix Is far superior to anything we’ve purchased from the other supermarkets. I’ve managed to fit the small kiwi flag onto the end of the piece of dowel purchased from Wickes. We don’t have a saw on board but the Leatherman multi-tool had a blade that did the trick. Walking around the exterior of Waiouru I can see some touch-up paint is required in a few places. But that won’t happen until the weather gets warmer. 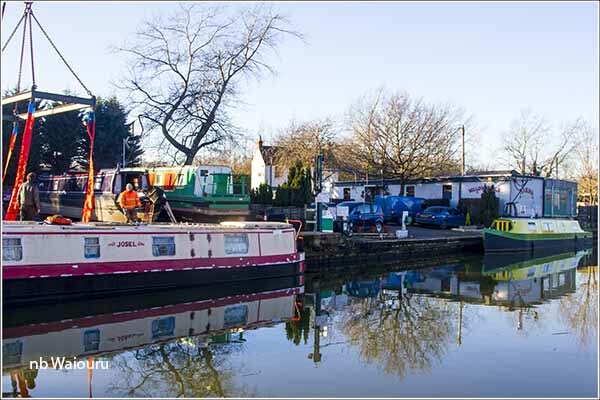 These canal boatyards make me laugh insisting that their customers hold insurance prior to carrying out work for them. Surely it is they who should show proof of public liability insurance as well as certification that their hoisting equipment is safe and compliant just as you say. I am convinced many try to pass the onus for insurance just to make their lives easier and cheaper in the event of something going wrong. 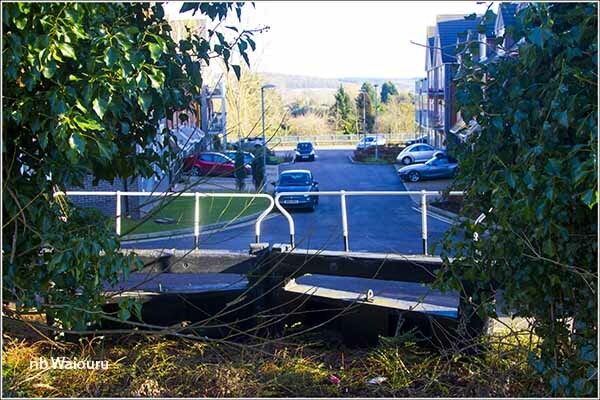 The boat owner should only require insurance to enter the marina in case they cause damage. I would always now want to view a boatyard's proof of insurance before trusting them with any work, but then I won't have to because I no longer own a boat due to the behaviour of one such marina. I'm almost convinced a number of them don't understand the law. This yard had a second sign notifying you that if you injured yourself on their property they were not responsible. The law doesn't work that way! Good job Maffi isn't following you, otherwise he might have just picked up that wheel-barrow and the other rubbish and put it in the next bin. Willowbridge is always the most expensive diesel in the area. Your best bet is to look out for the fuel boat, Beverley. Gary the owner always has a decent price -- he's usually in the Leighton Buzzard area, so above the Soulbury Three. 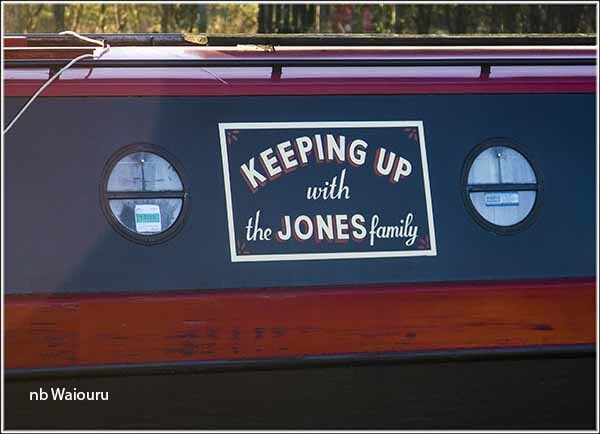 I believe Jules Fuels has also based one of her boats on your side of the stoppage, so that's another option. 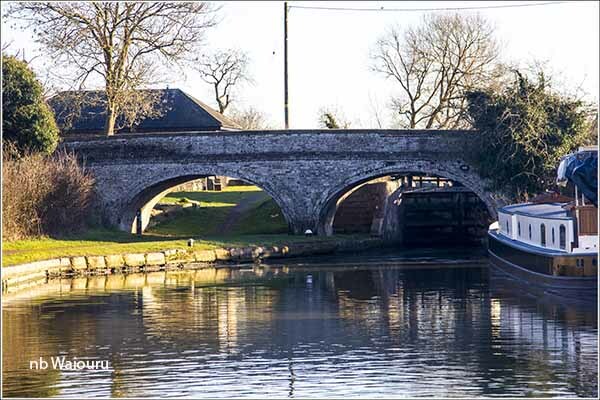 You'll see the double arches before locks a lot over the next few miles. There used to be narrow locks, and then they built the double ones alongside to speed the passage of working pairs. At some stage, unfortunately, the narrow locks were filled in. But you can see their outline at many of the locks. Hi Adam, Thanks for the fuel boat information, we will look for Beverley on our way to Leighton Buzzard after the stoppage. yes, Adam has mentioned that in an earlier comment. I'm looking forward to seeing more of them.